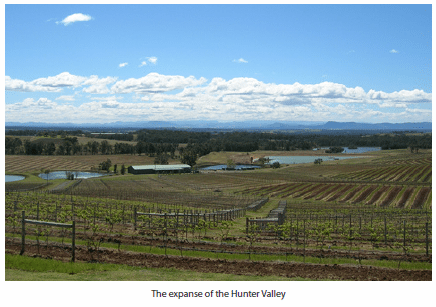 ew South Wales not only makes a sizeable contribution to Australia’s production of bulk wine but 160 km north-west of its largest city, Sydney, has a wine region of magnetic tourist attraction in the Hunter Valley. Thanks to the Great Dividing Range much potential remains and new regions will continue to make an impact if developed with quality as the foremost consideration. 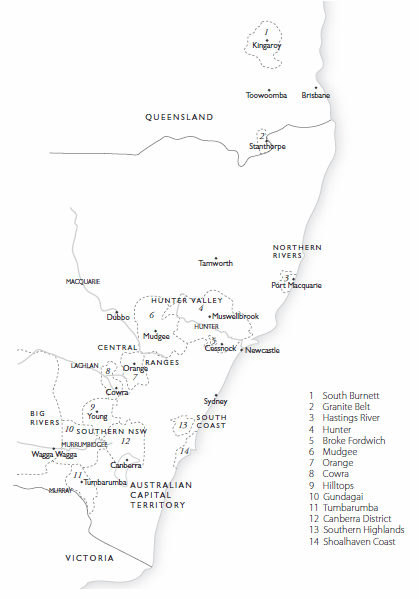 New SouthWales’ most traditional region is not, regrettably, the state’s most suited region to viticulture. The Lower Hunter Valley is peppered with estates lying just west of the Brokenback Range but, despite regular cloud cover, conditions are very hot and the greatest part of its rainfall usually comes as the growing season reaches its climax. Great vintages are the exception rather than the norm yet some marvellous ageworthy Shiraz and Sémillon are produced. Many Hunter-based producers now source fruit from Mudgee, Cowra or further south in the Central Ranges as well as producing wines from South Australia yet several of the greatest wines are purely Hunter in origin. Other than the big names of Brokenwood and Rosemount new operations are emerging, not least the very small production of Keith Tulloch, Andrew Thomas and Pepper Tree. Mudgee and the other regions which run down the western side of the Great Dividing Range are better protected from cyclonic deluges, making them both cooler and drier.Much of the grape production from Mudgee and Cowra has been dominated by the big producers and the harvest has been Hunter-bound, but many of the big players have pulled out of Mudgee and the vineyard area has contracted accordingly. Mudgee produces intensely flavoured well structured Cabernet Sauvignon, Shiraz, Chardonnay and Sémillon, though few producers other than Huntington Estate and Montrose give the region the recognition it deserves. However, there are some interesting wines made from Italian varietals so, like other regions, Mudgee is re-inventing itself. Cowra Chardonnay has a well-established distinctive, lush, full style of its own. Gaining increasing significance are Orange, Hilltops and, from close to the border with Victoria, the chilly, elevated Tumbarumba region. The latter is too remote to be other than a growing region but Orange and Hilltops have a growing number of boutique producers, some of whose wines are primarily sold via the cellar door. Similarly cool and elevated, with the associated risk of frost damage, are the vineyards of the Canberra District lying to the north of the country’s capital (but still in New SouthWales itself ). Despite the difficult, marginal conditions, the best reds are without question lifted and spicy cool climate styles of Shiraz, especially from the (unofficial) Murrumbateman region. The best whites are Riesling, Chardonnay and Viognier. Big Rivers suggests a lot of water and the vast vineyards of this zone are dependent on irrigation. The zone incorporates the commercially important bulk-producing regions of Riverina and, shared with Victoria on the Murray River, Murray Darling and Swan Hill. Not generally associated with fine quality, Riverina is the source of De Bortoli’s superb Noble One from botrytis enriched Sémillon grapes as well as other good, reasonably priced examples. Producing wine in Queensland is fraught with difficulties. Nonetheless wine is produced from South Burnett, around Kingaroy, and in the Granite Belt around Stanthorpe, in the Great Dividing Range, where it is cooler and elevated. The coastal hinterland around Mount Tamborine, behind the famous Gold Coast, has also attracted new wineries. Despite sometimes difficult vintage conditions good Shiraz, Cabernet Sauvignon and Merlot have been produced while whites show greatest promise when produced from Chardonnay, Sémillon or Verdelho.